Student debt can be devastating to a young person just starting out, and borrowing large amounts so early in life can have ripple effects that last for years. 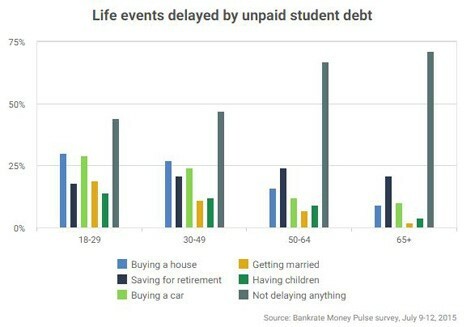 In a new survey from Bankrate.com, 56 percent of millennials say they have delayed taking a major step like getting married or buying a home or a car because of their debt load. By comparison, 43 percent of Americans aged 30 or older said that debt had delayed their reaching some financial milestones. Those delays not only prevent people from making progress toward their life goals, but they also represent a drag on the economy overall. The repercussions of student debt may also come as a surprise to some borrowers. More than half of those surveyed say they didn’t receive enough information or advice about the financial risks of taking on education loans. That number jumps to 66 percent among borrowers between the ages of 18 and 29. Outstanding student loan balances have ballooned to $1.19 trillion, including an increase of $78 billion between March of 2014 and March of 2015, according to a report on household debt and credit by the Federal Reserve Bank of New York.